Adding color to your exterior can be uplifting, as well as, give your home added curb appeal. Whether you prefer neutral colors or bright vibrant colors. Adding color is the best way to update your homes exterior. This stunning arts and crafts style bungalow is staying true to its roots in the early 1900s with dark chocolate colored exterior windows. When you shop our vinyl window replacement you can choose custom colors and hardware fixtures to suit your style. 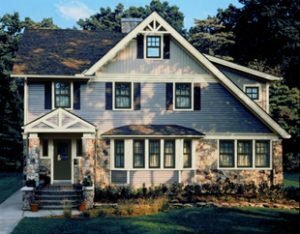 Kate Smith, (color expert) and president of Sensational Color, believes that adding color to key products on the home’s exterior can increase the value of the home, add curb appeal and enhance the overall living experience for homeowners. To show homeowners how to add “top down” color to the home, Smith has teamed up with Simonton Windows and Therma-Tru in the new 36-page FRESH Color Schemes for Your Home Exterior guide. 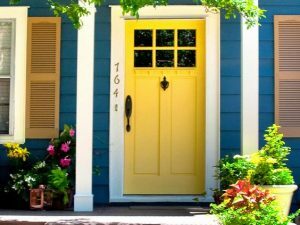 Can colorful windows and doors really help add curb appeal to a home? Red — tells the world to “look at me!” This bright color says I’m not afraid of standing out or saying what’s on my mind. White — says that I prefer things that are organized, neat and clean. Even if my home isn’t always this way, I wish it were! Green — tells the world that you have traditional values and enjoy being a member of the community. Black — says I’m consistent, conservative and reserved in my manner as well as my approach to color. With a black door I’m saying my design style is timeless rather than trendy. Blue – tells people you are naturally at ease in most situations and people are attracted to your easygoing personality. Yellow — says you have a personality similar to green, but a bit less traditional. You’re most likely a leader or organizer of a group. Purple — reveals a “free spirited” person who is comfortable taking risks, thinking differently and dreaming big. The free color guide is located at www.sensationalcolor.com. Vinyl window replacement can improve energy efficiency and reduce noise, the single-pane windows on the house were replaced with low maintenance energy efficient windows. 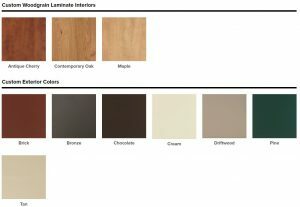 Fresh Color Schemes for Your Home Exterior dives into the unique styles, colors, patterns, and woodgrain options that Simonton has to offer. Decorum by Simonton is a portfolio of unique styling options that allows you to create a look that is distinctively yours. Interior laminates provide the rich warmth of woodgrain in Antique Cherry, Maple or Contemporary Oak, or the crisp, clean simplicity.